The temperature hovered in the upper 80s/low 90s for the full two weeks. The second week we were so grateful to be in an open-air space with languid ceiling fans helping circulate the slightly humid air. Providing professional development in one of the poorest countries in the world while wearing shorts was a novelty for me, and on many levels. Nice shorts, mind you, but shorts nonetheless. And practically a necessity. But thinking as though there was no box in sight was what really challenged me. In that second week, some of the local teachers had sessions they wanted to offer their colleagues. While the math session was quite good, the one that ripped my heart and blew my mind was the session on creating manipulatives and other hands-on resources using recyclables. By our first world standards, none of them were extraordinary except they were simply because of how they came to be. Need to find another way to help slow readers learn letters and their sounds? Use some old CDs, some scraps of paper, and whatever else you can find to create a sort of flash card concept. Looking for ways to help students learn their times tables and practice their addition, subtraction, and multiplication? 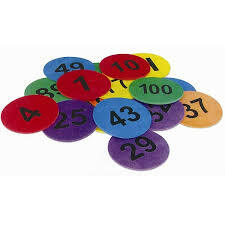 Let's make up some games using our hands or using those CDs but with numbers on them. Yea, you want to know more about that, don't you? So you could buy some number wooden disks for about $30 or get the rubber ones for more. Or you could paint numbers on an old CD or some pieces of wood or whatever scrap makes sense and has some substance. One of the game ideas was something like a "whack-a-mole" but for addition, subtraction, or multiplication. Put some of the disks on a table and call out the operation and the result of that operation. Kids have to smack the right disks. So "addition" and "10" and kids have to smack 8 and 2, or 6 and 4. You get the idea. Yes, it will be noisy. There are probably a dozen variations on that game alone. The other game we developed needs no manipulatives: just hands. Think of rock-paper-scissors. Kids start in pairs. The teacher calls out an operation: addition, subtraction, multiplication. Division is possible, but harder. Anyway, each kids smacks fist in palm and then shows some number of fingers; a fist on the third beat is zero. The first kid to complete the operation correctly based on the fingers shown, gets a point. So the teacher hollers out "multiplication" and the first kid shows 2 and the second kid shows 3. The first of the two to shout out 6 wins a point. So maybe you play to 5 points and then two pairs form a quad. Now you can work up to your 10 time tables and do more complex problems. The way this version works (and this is my own variation) is each student shows a number on the third count after the teacher calls out an operation. In pair #1, the first kid shows a 3 and the second kid shows a 0 (fist). In pair #2, the first kid shows a 4 and the second kid shows a 2. Each pair has to add its numbers and then perform the operation. So the first pair ends up with 3 and the second pair ends up with 6 and if the operation was addition the first pair to call out 9 wins the point. Another variation is multiple operations. The teacher calls out "multiply and add," or "subtract and multiply." Each pair has to perform the first operation on its own numbers and then the second operation on the combined numbers. So with multiply and add, the first pair gets 0 and the second pair gets 8, and the first pair to call out 8 wins the point. Now I'm back in my first world environment and murmuring with delight as I cuddle up to my technology and mind-numbing options. But I cannot forget what I saw those teachers bring as they tried to figure out how they might replicate some of our ideas using whatever they could gather and scrounge. Not just their passion and determination (let's talk about grit, shall we? ), but profoundly creative ways to engage their students and make a difficult learning experience more interesting.